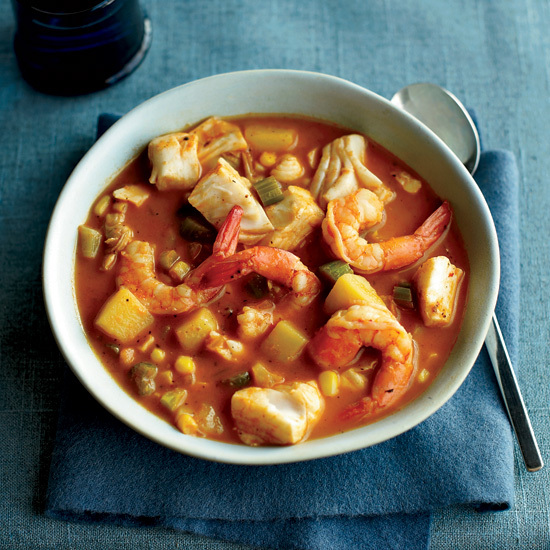 From Manhattan clam chowder to a smoky oyster chowder with bacon, here are delicious chowder recipes. Smoked fish—already cooked and intensely flavorful—is an ideal addition to dishes when time is of the essence. We’ve used trout here, but another flaky fish, such as haddock or whitefish, would work just as well. 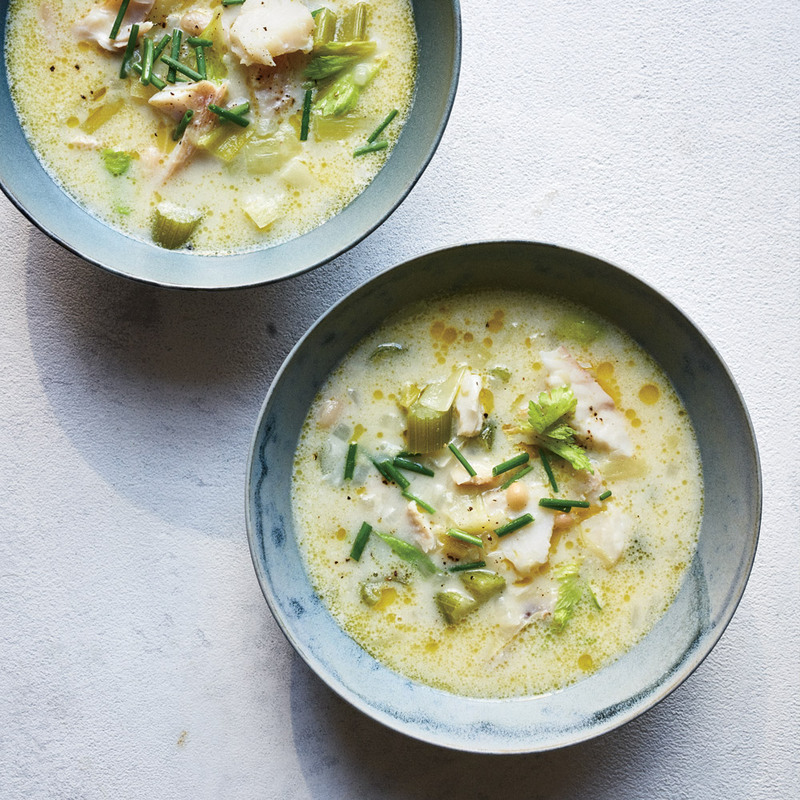 To make this lightly smoky chowder, Andrew Carmellini cleverly cooks potato chunks in milk and cream, which both enriches the potatoes and thickens the broth. 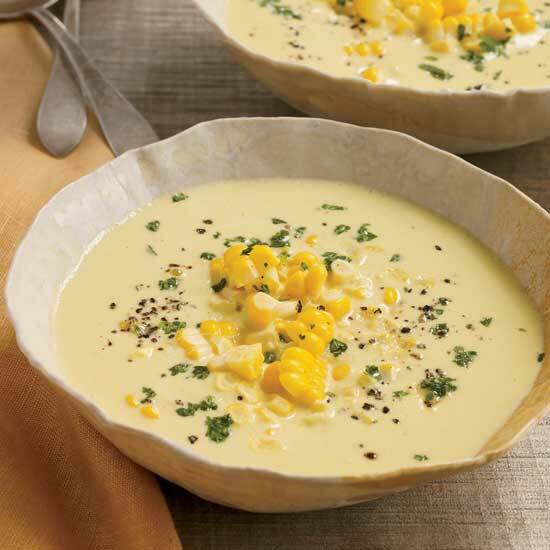 He also adds corn and a mix of herbs to brighten the flavor. 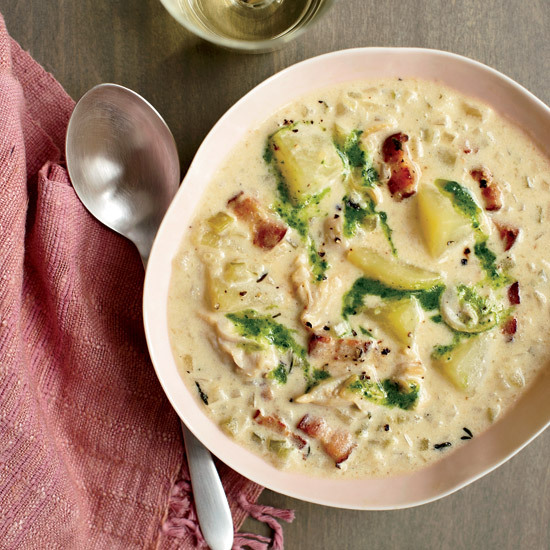 Food & Wine's Justin Chapple puts his own spin on chowder here, using beans instead of potatoes, and smoky whitefish in place of bacon. 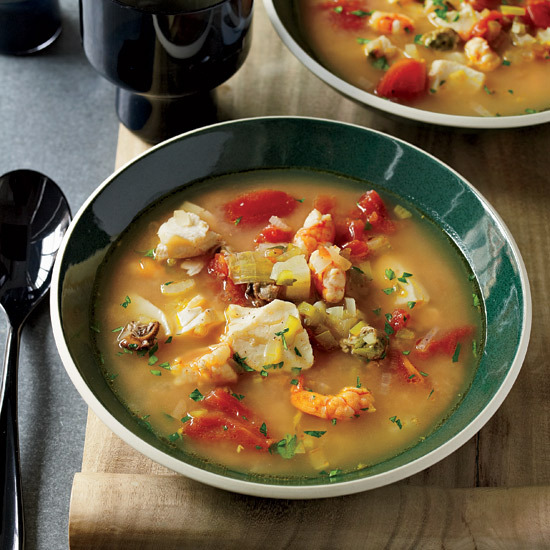 It's hearty and delicious but lighter and fresher than most chowders. David Myers garnishes his chowder with an edible still life of clams, mushrooms, dried seaweed and crisp mitsuba (a Japanese herb). 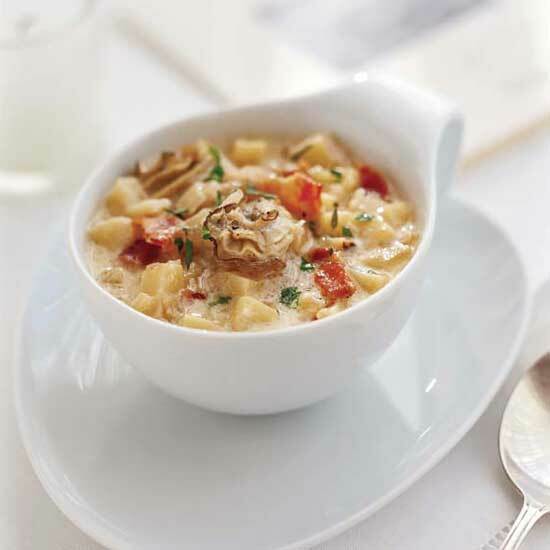 At home, a small amount of savory white miso paste gives New England-style clam chowder a Japanese accent. Parsley oil adds flavor. 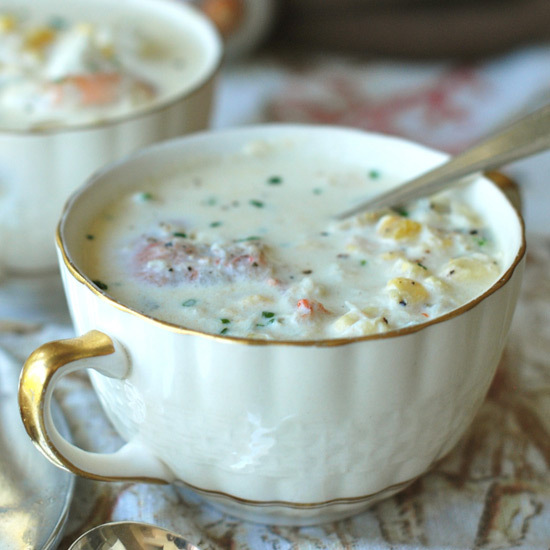 There are several tricks to this terrific chowder from Linton Hopkins. 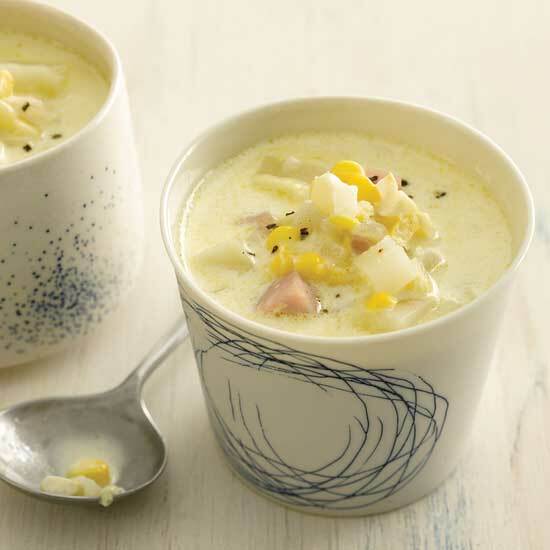 He adds potato chunks to the broth for thickness, then pours in a little naturally low-fat buttermilk for creamy tanginess. 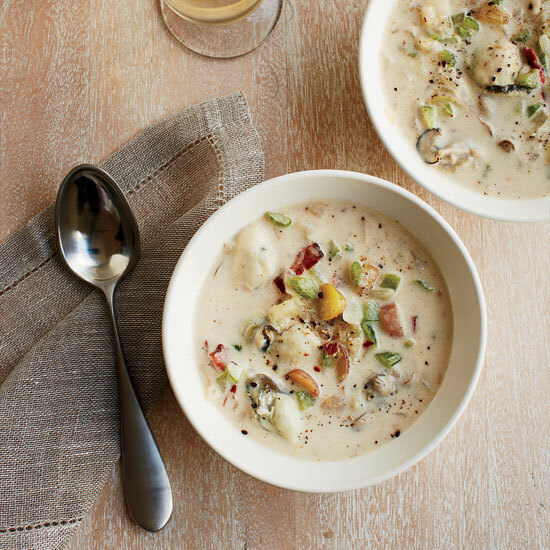 And instead of fatty bacon, he uses smoked oysters to give the chowder a slightly woodsy flavor. 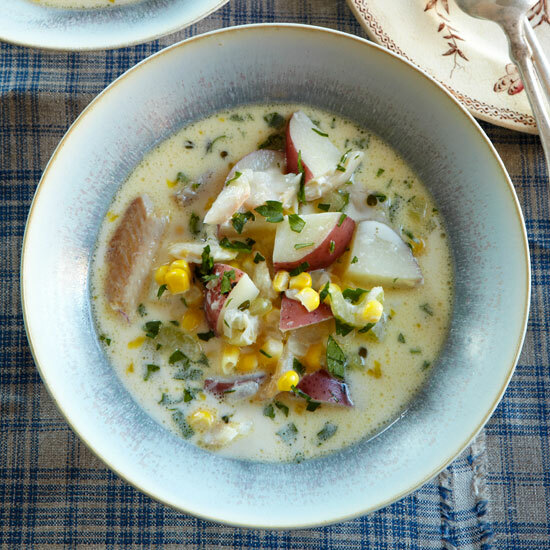 Melissa Rubel Jacobson deepens the flavor of this luxurious ham-and-corn chowder by simmering the scraps (the ham rind and corn cobs) in water to make a quick, tasty stock. 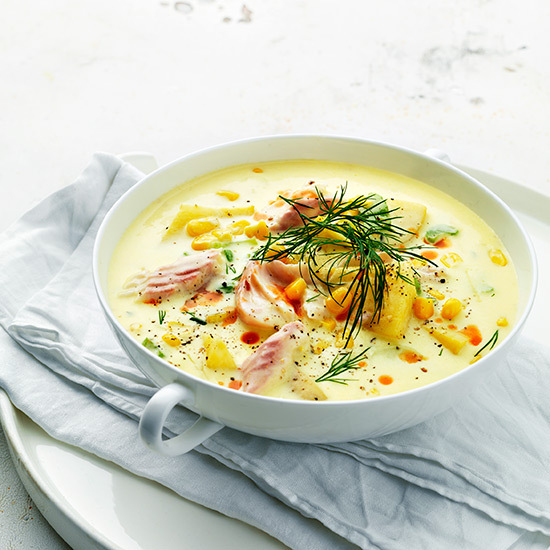 In Peru, small streams wend their way from the mountains to the coast, and the delicious shrimp that fill them are cooked with local corn, squash, and potatoes to make this South American chowder called cupe. Don't peel the shrimp before cooking them in Step 1: The shells will flavor the cooking oil, which in turn will flavor the soup. the corn is traditionally left on the cob, but if the prospect of eating it this way (it is messy) bothers you, use two cups of kernels instead. 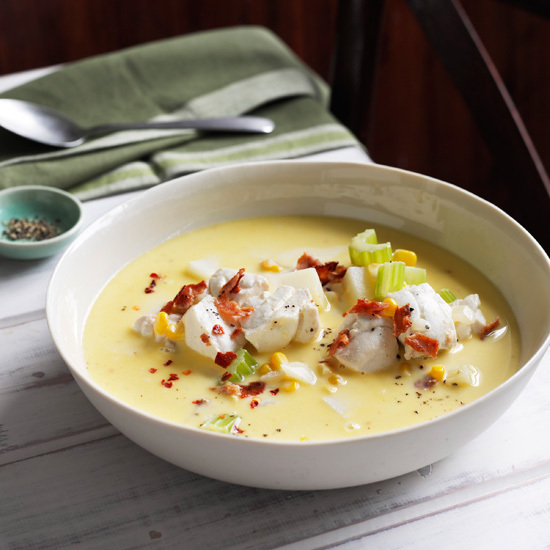 This velvety chowder from chef Dylan Fultineer is thickened with a classic flour-and-butter roux. He packs it with plump oysters and tender fingerling potatoes, and adds a kick of heat from dried red chiles. For extra flavor, he uses bacon from Benton’s Smoky Mountain Country Hams in Tennessee, which is famous for its intense smokiness. 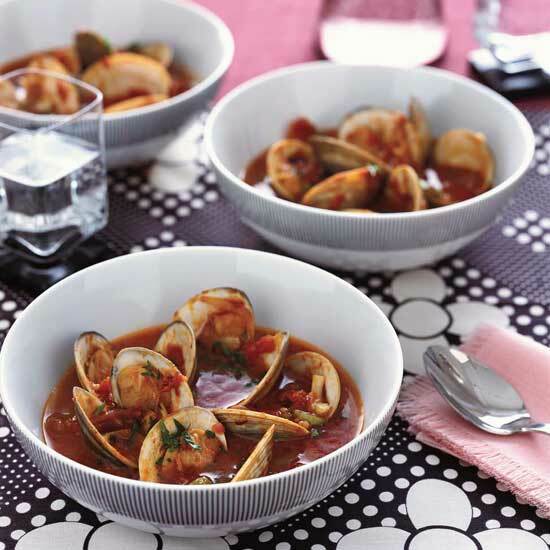 Chef Nicki Reiss set out to develop this hearty, healthful, tomato-packed clam chowder based on flavors she enjoyed on a trip to Spain. As an alternative to smoky (and fatty) chorizo, Reiss turned to soyrizo, her favorite soy-based vegetarian sausage. 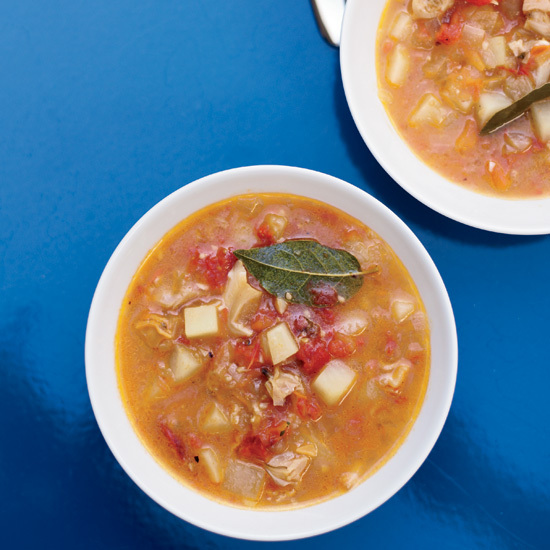 This light but intensely oystery soup was inspired by a recipe from Joanne Hendricks, the proprietor of the eponymous vintage-cookbook store in New York City. Salsify is a root vegetable shaped like a skinny parsnip; it has blackish skin with white flesh and tastes a little like artichoke hearts. If you have trouble finding it, you can substitute Jerusalem artichokes (sunchokes) or, as a last resort, the pedestrian potato. A recipe from Emeril Lagasse. 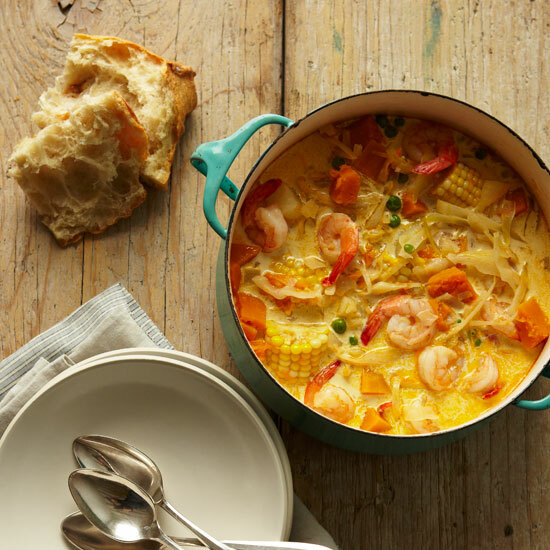 Andrew Zimmern adds depth to his rich seafood chowder by making an easy stock with corn cobs and shrimp shells. 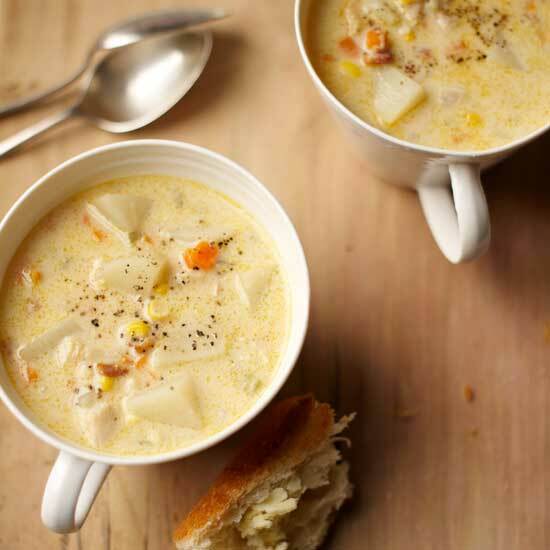 Plenty of cream and butter make this chowder irresistibly decadent. Not only is yellow corn a good source of vitamin B, magnesium and thiamin, it also contains carotenoids (organic pigments with health benefits) not found in white corn. Ani Phyo likes to add a handful of vitamin A-rich spinach or soft lettuce to the chowder. 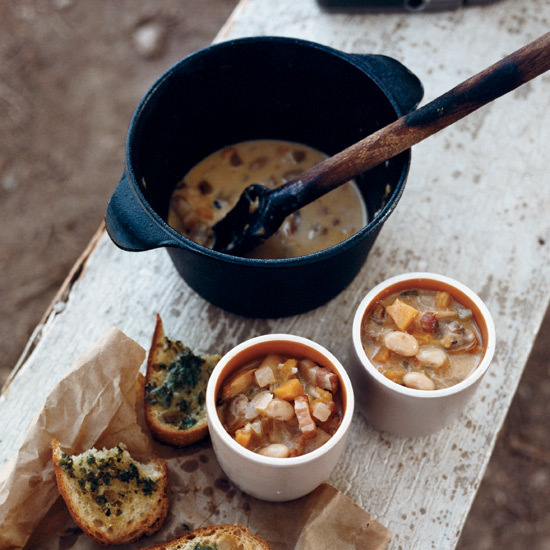 “Then it becomes part-soup, part-salad,” she says.